The most designer hoverboards of all time is back to get you a more dominating ride this season. No doubts we have hundreds of thousands of hoverboard brands in the industry of self balancing electric scooters, but selecting the right one becomes really tough. Right from its inception, the craze has amazed the population over the world and the celebrities took it to a different level. Now when you look at some of the most stylish hoverboards on the internet, you will certainly want one for yourself which is stylish and comfortable. Whenever we are looking to the safety conditions, we often look for UL 2272 certifications. Fortunately, the GYROOR F1 self balancing scooters have successfully passed the rigorous tests of Underwriters Laboratory. We understand how important it is for you and your family to have a safe and sound riding, and that’s why we recommend one of the certified standard hoverboards of all times. There won’t be issues of short circuiting or sparking. 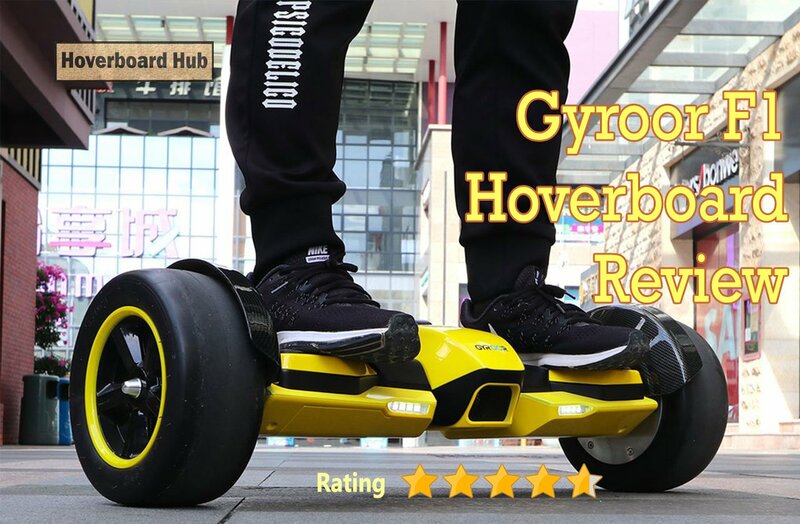 All you need to do is enjoy the superb ride on the exclusive Gyroor hoverboards. They are also safe to be used by the new riders who are in their learning phase. You no more need to worry about your feet slipping or your battery overheating. Also, you no more need to worry about the news of house fire and life loss due to hoverboard fires. It’s one step towards safety. The range of these hoverboards is exclusive as well. You can go on and on without bothering about how far you’d go. At a maximum you can cover upto 8-9 miles in a single charge. Range actually refers to the mileage the self balancing scooter provides. This non-stop riding experience can fill you up with all the energy and enthusiasm needed for a real time exciting ride. You no more need to stand by the road side and wonder why you didn’t charge your battery for another extra hour, it will be sufficient for your fun ride. You might wonder how fast you could go on a GYROOR F1 electric scooter. Well, these are fast enough and have a maximum speed limit of 7 miles per hour. You should know that when you are 6.5 inches above these give really like flying in the wind feeling. Every one of us love speed and riding at the speed of light. If you are someone who likes to outshine the rest, then this is simply perfect. Not only you can enjoy a perfect ride but also enjoy your favourite music with the help of high quality Bluetooth speaker in the hoverboard. These come with Bluetooth a speaker which enables you to listen to music of your choice and make your ride fun. The quality of these speakers is decent and has been appreciated by many of the buyers. These are the hoverboards which are light enough to be carried easily from one location to the other. These can easily fit into your car, bus or other means of transportation. More to it, you can even fit it into your carry bag and take it with you on your tours and trips. Imagine how much fun it would be if you carry it to your grandma’s house. Kids would simply love it! There are hoverboards which take more than 4-5 hours to charge fully but the good thing about these hoverboards is that these take just upto 2-3 hours to fill in the charge completely. So, these hoverboards are quick to charge and can retain their charge for comparative longer duration. The weight capacity of a self balancing electric scooter is the capacity of it to hold the weight of individuals. Every hoverboard has some deadline or threshold value of weight beyond which it is not recommended to load the board. The weight capacity of Gyroor F1 electric scooter is 265 pounds. The batteries used in these hoverboards are of prime quality and manufactured by some of the world’s trusted battery manufacturers. The batteries are tested as well under strict regulations and after that only they are approved. You no more need to worry about your hoverboards posing a threat of fire due to overheating or sparkling. It is all free from leakage and short circuiting. The smart battery management system and excellent battery sources have made them the top quality batteries of all time. The hoverboard which we are talking about is very much cool in its structure. When it comes to the looks, they are well maintained with outstanding emblem sculpted on each of its pedals. The design is doubtlessly unique and modern, and is small in size. Being small in size makes it light in weight and portable to be easily ridden. All in all, these self balancing electric scooters are reliable, light and come with a nominal price tag along with LEDs and other features. You can get a good built and design, well maintained motors and stylish wheels so as the crowd stares at you. They are classy in look and smart in built and has a decent budget. The speed is commendable and can easily go about at high speeds. The range is good as well and is ideal for long rides.